On October 23 Tunisians went to the polls to participate in the first elections since the Arab Spring. The elections were widely considered free and fair, representing a significant triumph in a region long beset by authoritarianism. With a turnout rate of just over 50 percent, the plurality of Tunisians — around 40 percent — cast their votes for Ennadha, or the Renaissance Party, a moderate Islamist party. Despite a clear victory over its nearest competitors, a number of more secularly minded parties won a similar percentage of the vote implying that this was not an absolute victory for the Islamist camp. Given the repression of political parties and the relatively short period between the Jasmine Revolution and the election, it is not entirely apparent what these election results mean about the preferences of ordinary citizens. Shortly before the election, between September 30 and October 11, the second wave of the Arab Barometer — an eleven-country public opinion poll — was conducted in Tunisia. The survey’s findings demonstrate that Ennahda’s victory was not a clear call for a more religious political system. The survey also provides insight into the broader political concerns of ordinary citizens, their attitudes toward the Jasmine Revolution and Tunisia’s ongoing political transition, as well as their preferences about the type of political system that should be utilized to govern their country. Based on the election results, there appears to be a more-or-less equal division between supporters and opponents of political Islam. There is some evidence for this understanding in the Arab Barometer. 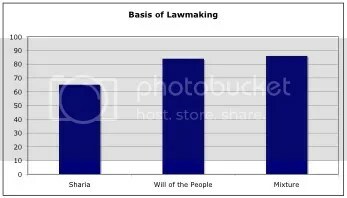 In response to a question on the proper basis for making laws, 65 percent of respondents indicated that they agreed with the statement that the government should implement only the sharia laws compared to 84 percent who stated that the government should make laws in accordance with the wishes of the people. An even higher percentage — 86 percent — stated that the government should implement the sharia laws in some areas and make laws according to people’s wishes in others, indicating that Tunisians believe that Islam should inform some elements of political life. Thus, it appears that Tunisians tend to support laws that are both grounded in the will of the people and in accordance with religious law. Other indicators suggest that Tunisians are not overly supportive of a significant role for Islam in political affairs. Although divisions exist within the party, Rached Ghannouchi, the long-time leader of Ennahda, has consistently stated that he and his party represent a progressive strain of Islamic reformism rather than a movement seeking to institute an Islamic state. This understanding of Islam’s role in politics — informing but not driving — appears consistent with the desires of a majority of respondents. When asked specifically about the role Islam should play in public life, sizeable majorities believed it should be minimal. For instance, 78.4 percent of respondents agreed that men of religion should not influence how citizens vote in elections, only 30.6 percent believed that it would be better for Tunisia if more religious officials held public office, and just 25.4 percent stated that men of religion should influence decisions of government. Moreover, 78.5 percent agreed with the statement that religion is a private matter that should be separate from social and political life. Thus, while many Tunisians believe that laws should generally not contravene sharia, most do not seek an active role for religion or religious officials in public life. Nevertheless, perceptions of Ennahda as an organization are more favorable than might be expected given its self-identification with Islam and the Islamist movement. Approximately half of respondents (49.4 percent) stated that they trust the party. This level of trust exceeded that of many organizations, including the Tunisian Labor Federation (37.8 percent), civil society organizations (43.8 percent), and political parties in general (28.2 percent). 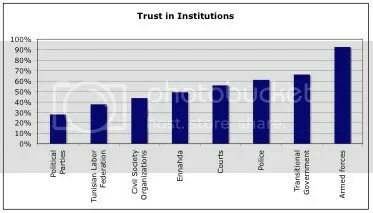 Trust was significantly higher for other political actors, however, including the transitional government (66.3 percent), the courts (55.9 percent), the police (61.2 percent), and the armed forces (92.6 percent). Despite fairly high levels of trust in Ennahda, stated support for the party is significantly lower. When respondents were asked which party best represents their aspirations for political, social, and economic development, only 11.9 percent chose Ennahda. Yet, when asked which party they would vote for in the elections, 19.9 percent stated Ennahda, likely implying that local factors and candidate selection were key elements of Ennahda’s electoral success. Other factors also help to explain why Ennahda’s vote share was significantly higher than the proportion of respondents who favor the party’s Islamist platform. One is Ennahda’s effective get-out-the-vote effort, which was far superior to that of any other party. Another is the legitimacy earned through years of opposition to the Ben Ali regime. Moreover, as one of the international election monitors was told, many Tunisians voted for Ennahda because the party knows those who were involved in the systematic oppression and, accordingly, it is better able than others to ensure that important members of the former regime do not slip back into the political arena. 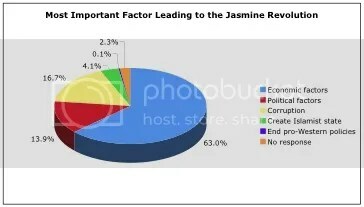 Reflecting on the Jasmine Revolution in the days prior to the election, half of respondents stated that they had benefited from the Revolution while a further 40 percent responded that the situation was more or less unchanged. Only 10 percent believed that they were worse off because of these political changes. Citizens also remained overwhelmingly optimistic about the long-term changes that may result from the Jasmine Revolution. Vast majorities believed that the result would be a democratic system (93.5 percent), better economic opportunities (94.9 percent), an improvement in human rights (93.9 percent), the establishment of the rule of law (92.4 percent), and greater social justice (92.5 percent). Although Tunisians desire sweeping changes from the previous system, most attributed the cause underlying the Jasmine Revolution to economic grievances. According to 63.0 percent of of the respondents, the primary cause of the uprisings was economic dissatisfaction and a further 17.9 percent identified this as the second-most important factor. The next most common reason cited was corruption within the system with 16.7 percent stating this was the most important reason and 45.4 percent stating it was the second-most important factor. By comparison, only 13.9 percent respondents stated that demands for political liberties were the most important reason for the uprisings; 28.6 percent said that they were the second-most important. Very small minorities cited other factors including the establishment of an Islamic state or ending Tunisia’s pro-Western policies. Given the nature of the grievances leading to the Jasmine Revolution, it is unsurprising that economic concerns still dominate the political arena. 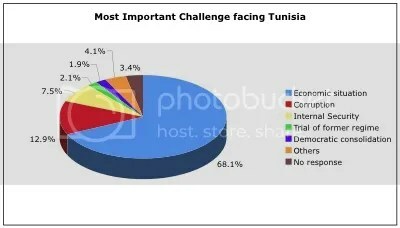 Nearly 70 percent of respondents stated that economic concerns such as inflation and unemployment were the most important challenge facing Tunisians. This was followed by the challenges of corruption (12.9 percent) and domestic security (7.5 percent). By comparison, only 1.9 percent of respondents cited democratic consolidation and only 1.4 percent cited free and fair elections as being the most important challenge facing Tunisia. This finding does not indicate that Tunisians are not supportive of democracy, however. Rather, 90.0 percent of respondents agreed with the statement that democracy may have its problems, but it is the best form of government. Similarly, 98.3 percent of respondents stated that a democratic system represented a good or very good manner of governing Tunisia. Additionally, this lack of concern about the political challenges does not appear to come from the fact that Tunisians believe the democratic transition has already been consolidated. Rather, only 28.1 percent of respondents believe that Tunisia is closer to being fully democratic than being fully authoritarian with the mean on a scale of 0 to 10 being 4.5. Nevertheless, it is clear that Tunisians believe that some aspects associated with liberal democracy have been achieved. The vast majority (90.2 percent) stated that one could criticize the government without fear. Yet, when asked to assess the state of democracy and human rights in the country, only 26.7 percent stated that it was good or very good compared to 18.6 percent who stated it was bad or very bad. By far the most common response was that it was neither good nor bad (45.6 percent), further demonstrating that citizens believe there is still much to be achieved in the political realm. One possible explanation for these relatively low ratings of democracy but lack of concern about political outcomes is related to how Tunisians understand democracy. Rather than understanding it in primarily political terms, as is common in many Western liberal democracies, many Tunisians, as Arab Barometer surveys show to be the case in other countries as well, focus on economic issues when thinking about democracy. Nearly half of Tunisians (48.3 percent) stated that the primary characteristic of democratic governance is a small income gap (21.1 percent), the provision of basic necessities for all members of society (22.4 percent), or the elimination of corruption (4.8 percent). 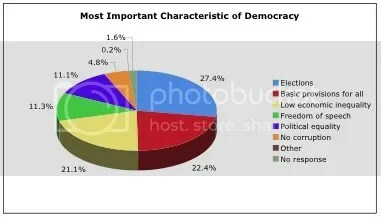 By comparison, 27.4 percent stated that the most important characteristic is free and fair elections, 11.3 percent said that it is the ability to criticize the government, and 11.1 percent stated that it is equality of political rights among citizens. One of the primary tasks for the newly elected constituent assembly is to devise a constitution that defines the future political system. One of the most critical decisions is to determine whether Tunisia will operate as a presidential or parliamentary system. Respondents were asked their opinion on this complex issue and, unsurprisingly, a large number stated that they did not know (21.5 percent). Of those who did offer an opinion, a majority supported a parliamentary system (52.9 percent). Only 15.4 percent indicated that they supported a presidential system similar to what existed between 1957 and the Jasmine Revolution and the remaining 32.0 percent stated that they preferred a mix of the two forms of government. While Tunisians desire a parliamentary system, they also seek a system that is civil rather than religious in nature. Over three-quarters (76.5 percent) of respondents indicated that they supported a civil state compared to 23.5 percent who stated that they wanted a religious state. Overall, Tunisians have strong and clear preferences about the future of their country. Support for a democratic system — broadly defined — is high and there is a general consensus that parliament should play a greater role in the political process than before. Importantly, despite Ennahda’s significant victory in constituent assembly elections, the vast majority of Tunisians desire a civil state with a limited political role for Islam in the political process, although most agree that laws should generally be consistent with sharia. As a result, Ennahda’s future popularity likely depends on its commitment to remaining a moderate Islamist party. It is also clear that Tunisians continue to have high hopes for the achievements of the ongoing political transition, although most central to these are hopes for a better economic future. Although political outcomes are also important, it is apparent based on the results of the Arab Barometer that a desire for greater economic opportunity drove the Jasmine Revolution and continues to be the key demand of the average Tunisian. Thus, while the constituent assembly will debate the merits of different forms of representative government, it is critical that the transitional government not lose sight of economic issues and that it promote reforms that bring benefits to all sectors of society. Otherwise, regardless of the political makeup determined by the draft constitution, grievances against the system are likely to continue.